The Second Story Loft is a modern gem in downtown Nantucket. 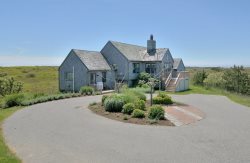 Located on the second floor of a completely renovated building which houses Nantucket Bookworks and ACKfresh juice bar on the first floor, the Second Story Loft features three bedrooms, 2.5 baths, and has a striking Great Room with a wall of books, comfortable seating area, generous table, and gourmet kitchen perfect for entertaining. The Second Story is a great spot from which to explore Town and the island. Cars are not necessary, as the loft is located in easy walking distance from the ferries, and shuttle buses and taxis are readily available. When you stay at the Second Story Loft, you can pop down to the bookstore not just for books, but for coffee, juice, and grab and go foods as well! The building is surrounded by hotels and restaurants. (Please note that it is an "urban" environment in that sense, so restaurant activities may be audible at times.) You'll be mere steps from the Brotherhood of Thieves, Le Languedoc, Dune, Nantucket Prime, the Corner Table at the Nantucket Culinary Center, and many more. The Nantucket Visitors' Center is right around the corner, as is the free shuttle to Cisco Brewers. The Nantucket Whaling Museum is just a few doors down on the way to the Steamship Authority and the fast food "Strip." World class shopping is located blocks away.